Interviewing for a job is one of life’s unnerving necessities. Rarely does someone actually enjoy going through the interview process! Typically tensions are high, competition is everywhere, and great job opportunities are limited. You want to ace that interview! However, after the interview is over, you never get a callback! What went wrong? You tried so hard to find ways to stand out in the job interview. I spent several years working in Human Resources, interviewing many job applicants. I was trained to ask certain questions and look for certain signs that an applicant was or was not the right fit for the job they were interviewing for. 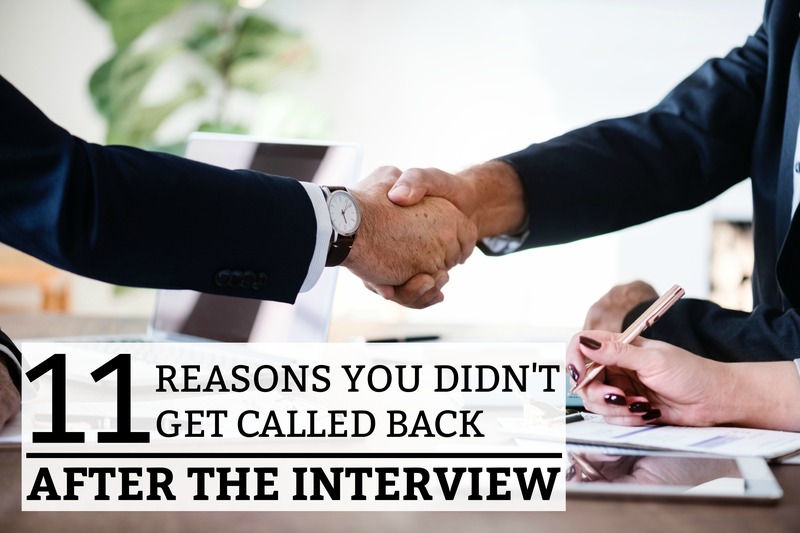 If you have not received a callback or have been turned down for a job position you really wanted, you may have made one of the 11 common interview mistakes listed below. You should ALWAYS speak respectfully of your past employment opportunities! NEVER make derogatory comments about a previous company, boss, or coworkers. It is a huge red flag when someone talks negatively about their past employment. Even if the complaint is merited, always choose to remain positive and respectful. While interviewing applicants, my job was to “get to know” the applicant professionally and personally. A person may have a glowing resume and fit the job qualifications perfectly, and yet their personality showed red flags of being disrespectful, negative, argumentative, or overly-superior. I wasn’t only interviewing for the job position – I was also interviewing for a person who would mingle well with their co-workers. The interview process is NOT a venting session. This is not the time to talk about your awful boss or narcissistic co-worker! Remember, the job interviewer may dig for more information on why you left you last job. Don’t fall for it! If you don’t have anything nice to say, simply respond with, “Although I appreciated the experience I received in my past position, I simply wasn’t passionate about what I was doing. I have decided to move on to a job that I know I will find more interesting and enjoyable, such as the job I am interviewing for now.” Take the opportunity to turn the question into a way to talk about the company you are interviewing with. Problem solved! One of the first questions that many interviewers will ask is, “Why do you want to work for this company?” They are not looking for a generic answer like, “I’ve heard good things about you” or “It seems like a good opportunity.” They are looking for you to go above and beyond in your answer! This was the reason that I did not get a callback after my very first interview out of college! I made a dumb, rookie mistake! The bank manager asked me which of their bank motto’s I liked the best. I said, “Hmmmm, there are so many of them, I can’t think of one I like the most.” When she pressed me to name one, I couldn’t name any because I didn’t know even one! I still blush when remembering how stupid I must have looked! Before going in for you interview, take the initiative to learn about the company! If you know little about the company, it will quickly become very apparent during your interview. Ummm, you know, to be honest, like, you know what I mean, so…. Filler words make you look insecure and nervous! During an interview, you have to show the best version of yourself. If you use a lot of filler words during your interview, it shows a lack of communication skills and confidence. Get in front of a mirror and practice! Conduct an internet search for common interview questions – you will get many great suggestions. Come up with an answer to the questions you find most difficult. This will help you feel more prepared and confident when you are in front of a potential employer. Huge, no-no! During an interview, your cellphone should be turned off and put away. It should not be seen or heard during an interview. While being trained in Human Resources, I was trained to cross the applicant off the list if they kept their cellphone out. This was a sign of unprofessionalism and showed that they would probably spend too much time on their phone while on the job. If, for some reason your phone does go off in an interview, apologize and turn the phone off immediately. Don’t ignore it! Hold your head high and remain cool, calm, and collected. This will help to show that you made an error and still remained professional – a good quality in an employee. If you are looking for a corporate job, dress according to their dress code (typically business casual). Choose outfits that err on the side of standard, conservative appearance. Ladies don’t wear plunging necklines and short skirts. Men don’t wear an ill-fitted suit and tennis shoes. I’ve seen job applicants who were immediately disqualified simply because their appearance was sloppy or inappropriate. We live in a generation where it is very common for people to say, “Sh*t”, “F*ck”, “B*tch”, “A**hole”, etc. Most people have said at least of few of these words in their lifetime. However, it is completely unacceptable in a professional environment. Recently, I was watching an episode of ABC’s “Shark Tank”. An entrepreneur was pitching their business idea to the “sharks” and let a few F-bombs slip. Every single one of the 5 sharks raised their eyebrows and looked at each other. Of course most of them have used this word before, but it was not a proper place to use it! Needless to say, this person did not walk away with a deal. There is a reason that television networks only allow certain words to be publically broadcasted. There is still a social stigma surrounding certain words, regardless of how many people say them! They aren’t appropriate. Stay professional and NEVER use this language in an interview. I know this policy may seem old-school, but it still applies today. If you immediately ask about your salary, benefits, or vacation time, it may make you look you are more interested in the company perks than actually performing well within the company. Yes, of course we are all interested in the money side of things! However, that is not the time to discuss it. An interview is actually the time to show that you are worth more money! If the job gets extended to you, you may be able to negotiate a higher rate of pay based off your qualifications and value to the company. Unless the interviewer brings up the topic of salary and benefits, always wait until you are in the final stages of the interview process to inquire about and negotiate these terms. These tips may sound trivial, but they actually hold a great amount of importance! Have several extra copies of your resume – updated! If you want to be considered for a job, you must go to the interview prepared and professional. Resumes don’t have to be fancy, but they do have to be clear and concise! Google some resume examples. As a bonus, you can even buy some professional resume paper at Office Depot. Extra effort can actually go a long way. Buy a professional binder. Bring, several pens, a note pad, and your ID. Think ahead and imagine what could go wrong. Perhaps you need some breath mints! After one job interview, I was asked for my license plate number (security purposes). I had to make a long 15-minute walk to my car in a distant parking garage. You should already know everything you can about the company you’re interested in joining. Check out their company website and follow them on LinkedIn. Being late to an interview implies that you did not make this meeting a priority and that you do not regard timeliness as a necessity. If you are late for an interview, you will surely be late for your job! When preparing for an interview, always drive by the company location a day or two before the interview date. This way, you will know the correct location, parking situation, and surrounding traffic patterns. Having absolutely no questions at the end of an interview makes it look unprepared and disinterested in the company and it’s culture. If you are really interested in the job, there are dozens of questions that you could ask! This article will show you a few of the most important questions you should ask. Never forget to ask, “What are the next steps in the hiring process?” This way, you will not sit at home wondering if you will ever receive a call. Maybe their decision process will take more than a month. If possible, try to get the interviewers contact information. This will ensure that you have a point of contact, so you can write them a nice thank-you note after the interview and follow up if you do not hear back about a hiring decision. It is sometimes hard to admit when you are not qualified for a job. But, sometimes, you simply aren’t! When applying for jobs, don’t waste your time with jobs that you aren’t ready for. Always read through the list of job-qualifications and see if you can add any value. If not, save yourself the time and pressure of possibly being interviewed for a job you know nothing about. Believe me, it will only be embarrassing for you and annoying to the person interviewing you! If you really want the job, build your skill set to meet the qualifications. My husband wanted a specific financial job, so he took a few courses and acquired several licenses. AND IT PAID OFF! It took a lot of effort on his part, but he was able to meet the job qualifications and eventually get a job in the industry he wanted. Continued learning never goes out of style! Invest in yourself and further your education if you want to change careers or qualify for a new job. It shows that you are a goal-driven individual with superior work ethic. If you never received a callback, at least you can learn from your mistakes! Don’t get down on yourself – it has happened to all of us! Challenge yourself to improve your interviewing skills for next time. Enjoyed the list of reasons. I think my issue is the last one that mentions, ” Not Qualified. ” Every job I want to apply for you need a Bachelor’s degree and I’m currently in my sophomore year of college and working towards that, but haven’t found any useful tips or list of certifications I use to get most of the jobs that require a college degree. Any advice would be helpful in this on going job search. Hi Brad! I’m glad that you enjoyed the list. Back when I was in college, I experienced the exact same frustration. While working as an HR rep, I created and posted many job positions. As a general rule of thumb, many companies choose to put a Bachelor’s Degree as a job requirement. This is often done as a way to ensure that only serious, qualified, and educated individuals apply for the job (and discourage the unqualified). I was instructed to add this qualification to every single job position, even though it was NOT always a requirement. I interviewed college students and professionals who did not have a college degree, but did meet the other requirements. I would recommend that you add your degree on your resume and what year you are currently in. This will show a company that you are serious about your education and investing in your future. Go ahead and apply for jobs that do require a degree – because you never know unless you try. You just might get a call. Good luck!